エール 《★【解説】 ale は beer と発酵方法が異なり beer よりも苦くて強い》. An operation of Windows Filtering Platform (WFP) which provides enforcement for security policies by, in each case, trapping the event, determine what application initiated it, and query the filter engine to determine whether the socket should be allowed to proceed. From Middle English, from 古期英語 ealu, ealo, from Proto-Germanic *alu (compare Dutch aal, Swedish öl), from Proto-Indo-European *h₂elut- (“beer”), or *h₂elu- (“bitter”). Compare Russian ол (ol), Lithuanian alùs, Armenian օղի (ōłi); compare also Latin alum (“comfrey”), alūta (“tawed leather”), Ancient Greek ἀλύδοιμος (alúdoimos, “bitter”). (dated) A beer made without hops. A beer produced by so-called warm fermentation and not pressurized. A festival in English country places, so called from the liquor drunk. Ale is a type of beer brewed from malted barley using a warm fermentation with a strain of brewers' yeast. The yeast will ferment the beer quickly, giving it a sweet, full bodied and fruity taste. 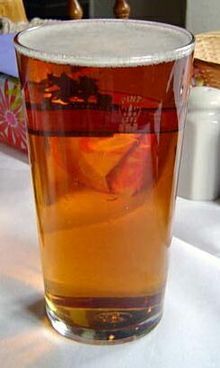 Most ales contain hops, which help preserve the beer and impart a bitter herbal flavour that balances the sweetness of the malt.